Christmas has always been a really important time for me. I love preparing for and celebrating the birth of my Savior, giving and receiving gifts, singing Christmas carols, and spending time with family and friends. So, it was’t easy for me to agree to taking a family vacation over the Christmas holiday, knowing I would be leaving behind traditions I’ve always cherished. However, Steve’s time off this year for the holidays was limited, and this was one of our rare opportunities to get away for more than a few days at a time, so we decided to just go. 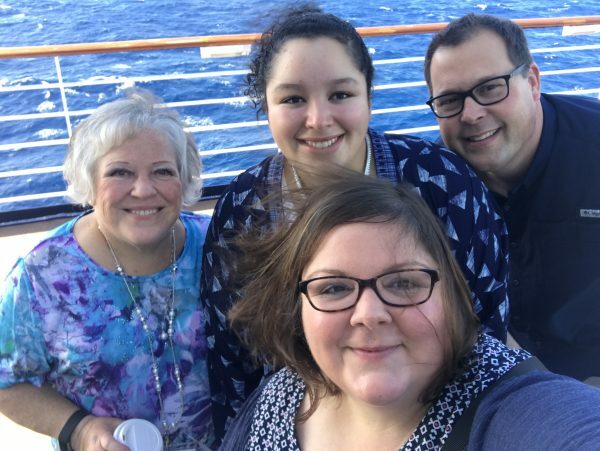 We did our best to incorporate as many of our Christmas traditions as I could, and we enjoyed a wonderful vacation, along with our daughter, Meghan, and my mom, Carol. 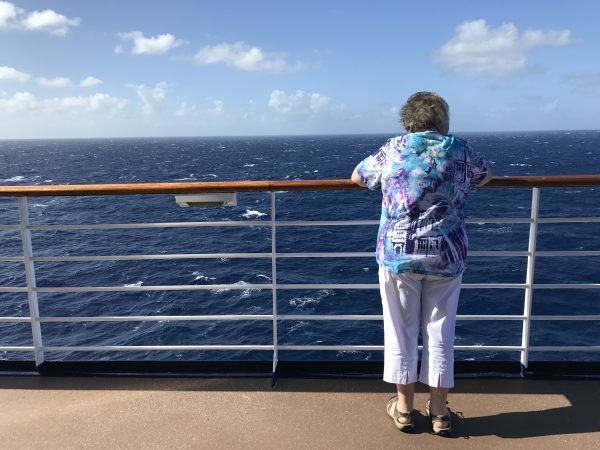 We boarded the Celebrity Summit on Christmas Eve and awoke Christmas morning to sunny skies and the beautiful blue waters of the Caribbean Sea. We started our day with a lovely breakfast in Luminae where we were reunited with Gustavo — one of our favorite servers from a cruise we’d taken earlier this year on another ship. 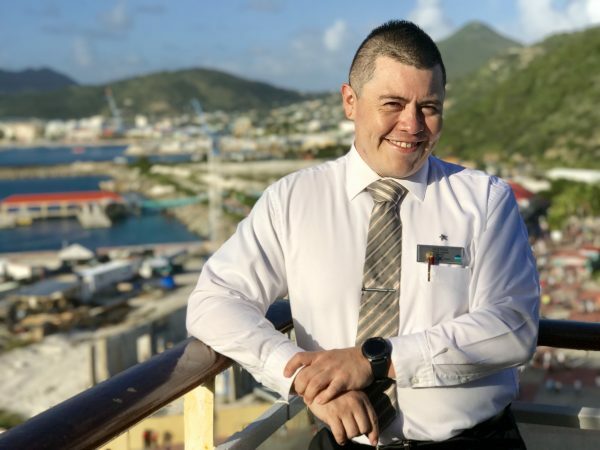 We loved his smile and bubbly personality, his strong work ethic, and all the ways he went above and beyond to make our last cruise so enjoyable. 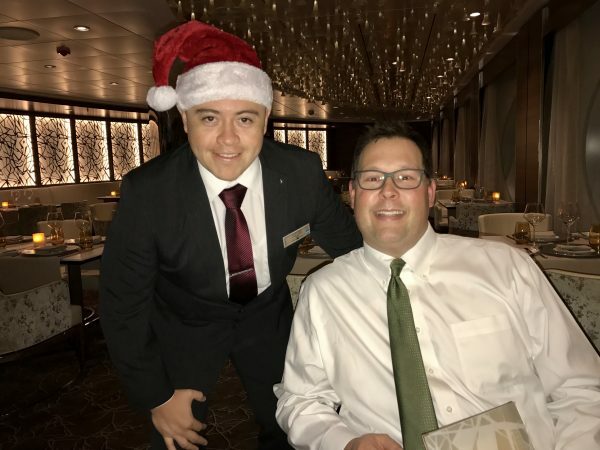 Gustavo is one of the many incredible crew members on the Celebrity Summit whom we’ve had the privilege to meet. He had mentioned when we met him this summer that he was going to be working on the Summit next, so we were anticipating seeing him onboard and wanted to do something special for him for Christmas. I remembered he was from Mexico and since the town where we live has several Mexican bakeries and grocery stores, I picked up a few treats that I hoped would be familiar to Gustavo and packed them in my suitcase, along with a Postcard Jar t-shirt. 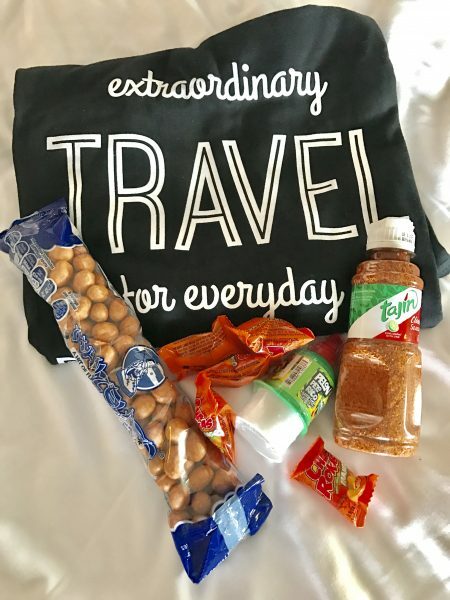 We packed a Postcard Jar t-shirt as well as some snacks from Mexico for one of our favorite crew members for Christmas. Christmas morning, I wrapped them up and brought the gift bag for him at breakfast. I know it must have been difficult for Gustavo to be so far away from home (and working) on such a special day, and we wanted him to know he was loved by God and by us. The smile it brought to his face was such a blessing! After breakfast, we took a short walk around the ship’s deck, just soaking in the sun (which we hadn’t seen in a while) and enjoying the spectacular views. It didn’t seem quite like Christmas to be surrounded by the sea and the sun, but we enjoyed every minute of it. 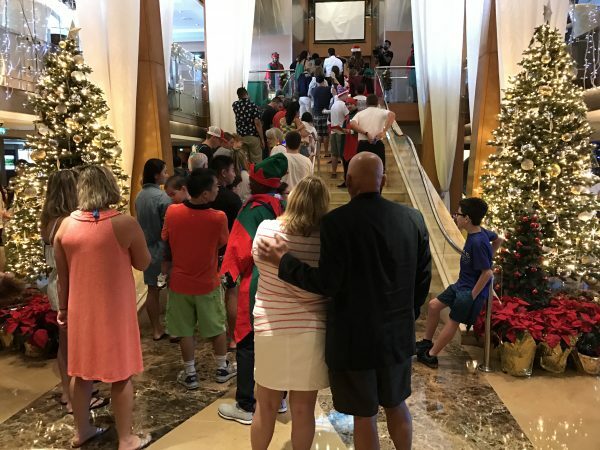 After that, we went by the grand foyer where Santa Claus was making an appearance and greeting all of the ship’s children with gifts. 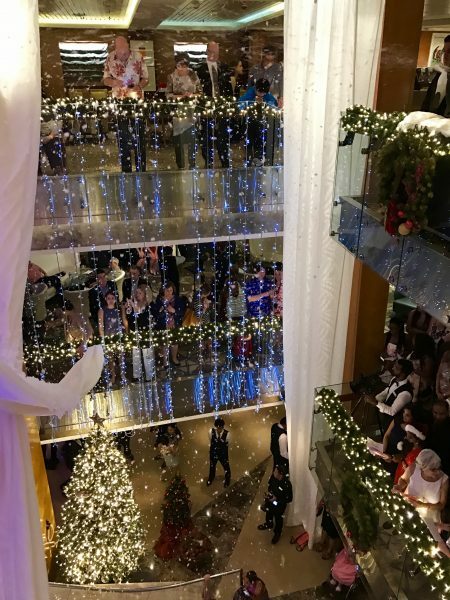 Celebrity Cruises had the Grand Foyer beautifully decorated for Christmas and Santa was there to give gifts to all of the children on board. From what we saw, the older kids received beach towels and the younger ones got plush toys. Next, we returned to our cabin to exchange a few gifts and I surprised the rest of group with personalized stockings. 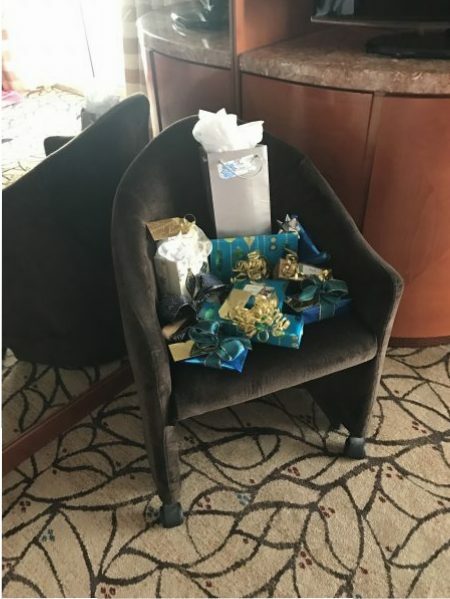 While I wasn’t able to display them on a fireplace mantel or under a Christmas tree, I made do with a small chair in our room and we had a great time opening presents and celebrating Christmas together. 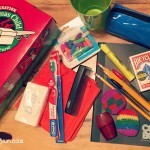 I chose gifts this year that were very small in size and packed wrapping paper and bows ahead of time. 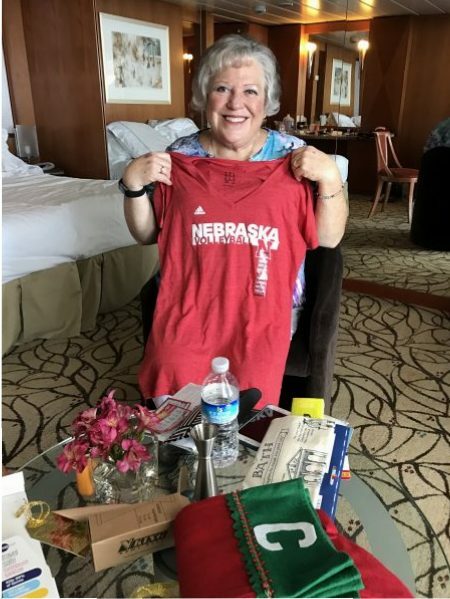 Mom loved the Nebraska volleyball t-shirt we got her for Christmas. To read more about how I was able to pack nine gifts, stockings, stuffers, and wrapping supplies in my suitcase and still keep it under 50 pounds, CLICK HERE. We relaxed much of the afternoon and met up at the Martini Bar for a cocktail before dinner. We enjoyed another wonderful meal at Luminae, which even included traditional Christmas favorites like turkey and dressing. Gustavo and Steve at dinner in Luminae on Christmas Day. After dinner, we gathered in the foyer with other passengers and crew to sing Christmas carols while fake snow was blown in. Fake snow fell for three decks as crew and passengers joined in the singing of traditional Christmas carols. We ended the evening in the Celebrity Theater with a holiday show and then retreated to our rooms. 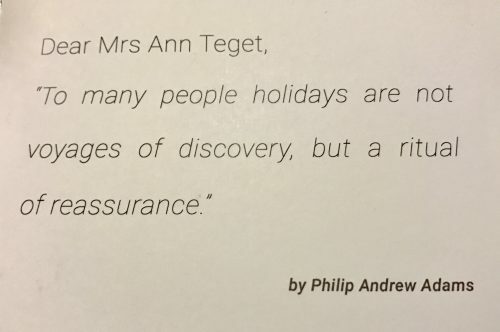 There, I found this lovely ornament and message, which will both be nice reminders of our Christmas at sea. 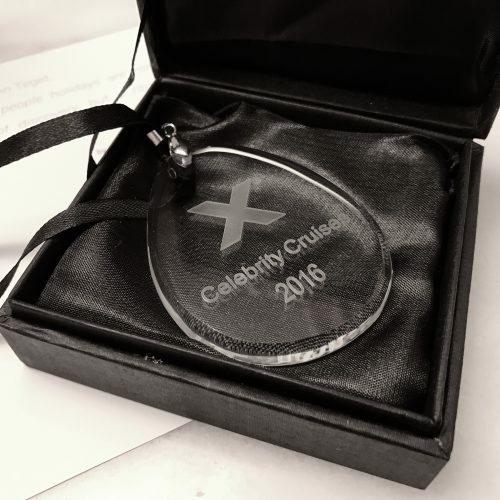 This Christmas tree ornament was a nice gift from Celebrity and will be a great reminder of our Christmas at sea. This Christmas was different than most we’ve shared. I missed our church service, the snow-covered landscape of our backyard, and watching the lights twinkle on our Christmas tree. But I cherished the time with family, the opportunity to travel someplace new, and the joy of celebrating the birth of Jesus Christ — no matter where we are.